If you are a homeowner who is planning a weekend garage clean-out, home improvement or a major landscaping project, a roll off dumpster may be necessary. When you have major landscaping work done, for example, it’s easy to forget just how much debris piles up. And a dumpster is the last thing you think of when you start tearing down walls in a remodeling project, but you quickly realize that the bulk trash service will never take all of the old material away by regular curbside service. Or when you finally decide to clear out the garage or have a garage sale and find there is so much junk that needs to be thrown away. 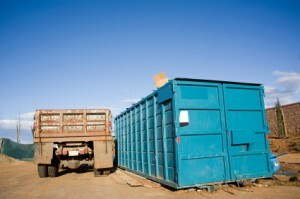 One of our affordable roll off dumpsters is a great choice for these home project needs. Use your gift card today! 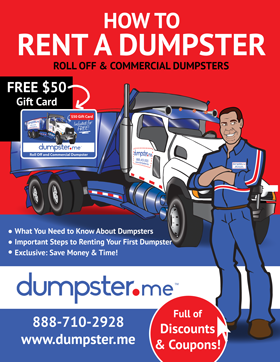 Or call us at (888) 710-2928 toll free to order your Roll Off Dumpster. You will want to make sure you choose the best sized roll off dumpster for your project so you do not incur initial unnecessary expenses by going too large or incurring extra cost during the project by going too small, requiring you to schedule extra hauls to remove all the debris. 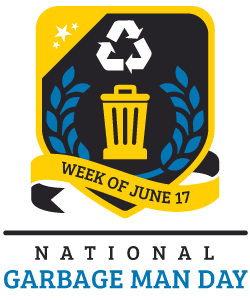 Each cubic yard will hold roughly 15 (thirteen gallon) kitchen-sized trash bags or about 6 (thirty gallon) large trash bags. To also aid in helping you determine the best size, please see our *pictures and dimensions* of all roll off and commercial dumpsters. 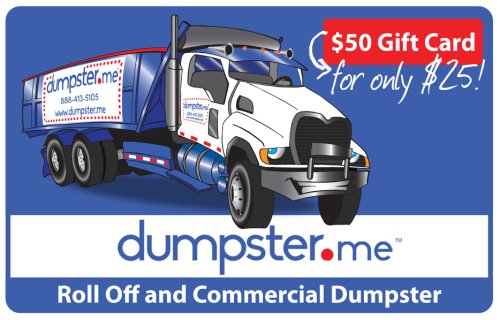 Order Your Roll Off Dumpster Online Now. Quick and Easy. While determining which size roll off dumpster you need for your project you will also want to consider if you have enough space on the project site to hold the dumpster. It is recommended you allow for double the width and height to accommodate the dumpster size you choose. Also allow for an additional 10’ for the door to swing open at the back of the dumpster. You will also want to make sure there is enough room for the truck to pull in and out to deliver and pick up the dumpster. For questions regarding the space requirements or to place your order now, simply call us at (888) 710-2928 today. Many items and debris are allowed in the dumpster but there are also items that are not allowed or even safe to be thrown into the dumpster. Such items include, hazardous waste, medical waste, dirt, industrial waste, radioactive material, chemical products, oil filters, herbicides & pesticides, solvents, paint (except completely dried latex paint cans, no liquids), other flammable liquids, aerosol cans, propane tanks, motor oil, transmission oil/lubricating/hydraulic oil/oil filters, contaminated oils (mixed with solvents, gasoline, etc. ), antifreeze, petroleum contaminated soil/lead paint chips, tires, appliances, fluorescent tubes, batteries, computers, monitors, televisions, microwaves, railroad ties, asbestos, animals, barrels and all liquids. Material must be level at the top of the container; nothing can be sticking out of the top, this is for your safety and the safety of your friends and family. A roll-off dumpster that is provided by Dumpster.me and it’s affiliates is an open top dumpster characterized by a rectangular footprint, utilizing wheels to facilitate rolling the dumpster in place. The open top container is designed to be transported by special roll-off trucks. Roll-offs are commonly used to contain loads of construction and demolition waste or other waste types. Ordering your roll off dumpster is easy, simply select the appropriate roll off dumpster size and enter your gift card code! Or call toll free at (888) 710-2928. Don’t have a gift card or code? No problem. 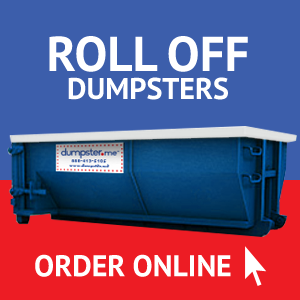 You can still place your order online or by phone for a roll off dumpster. Order online now or call today at 1-888-710-2928. Use your gift card!